Taken with the iPhone. Through my dirty windshield. I was at the end of Birmingham Bridge ready to go up the hill onto Kirkpatrick Street to Centre. Not ideal conditions but there were those four fireplace openings staring at me as I sat and watched the cars come down Kirkpatrick Street. Different from my daily route, it was my old route from last year’s school but I’d gotten my hair cut on Carson Street and was headed home. 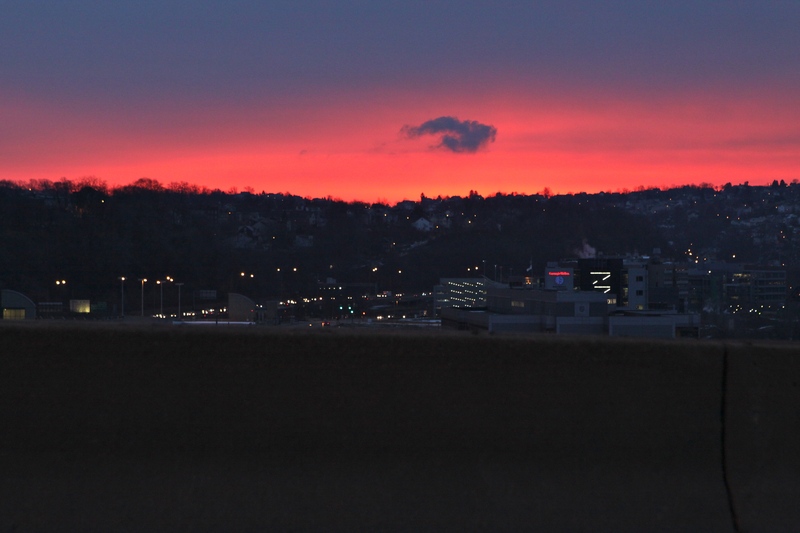 You might remember Jurassic Pittsburgh from April 2012 if you ‘ve been following for awhile. 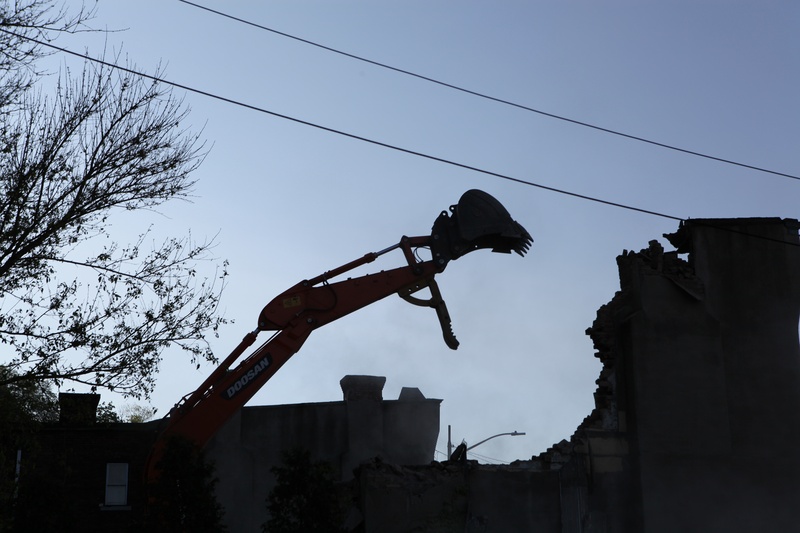 I took that shot of the dinosaur-like demolition machine on the way to my former school. Added it here at the end cause who has time to back and look. 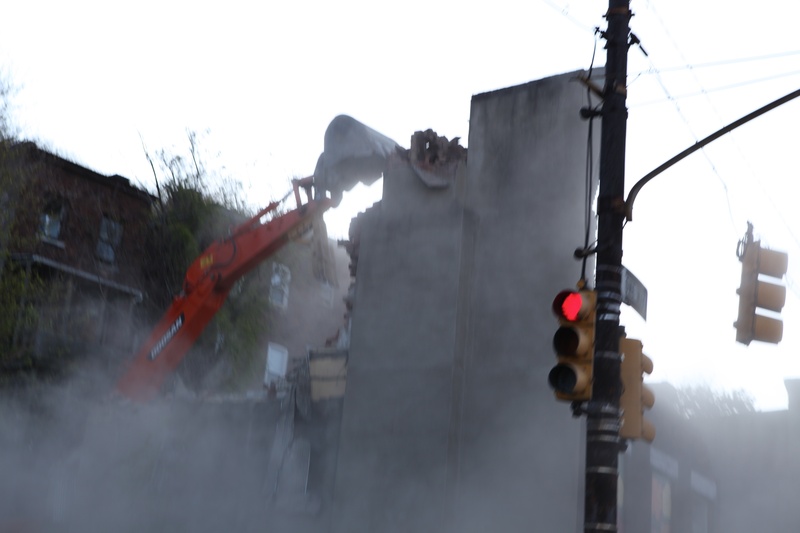 But this is the result of the demolition. Below are the photos from April 2012 that I took on the way to my former school. Left the house a bit earlier to get to the other side of the city this morning. As I hit the Birmingham Bridge I saw the sunrise. I pulled to the edge, hit the flashers again and sat quietly, and shot the sky over a few minutes time. The other direction I could see cars on the Parkway with their headlights on. A nice way to start the day. But the Red Sky,Sailors Take Warning turned out true as it is snowing (about 3 inches so far) and already they have called for a two hour delay at school. The dark band along the bottom of the photo is the Jersey Barrier. Unretouched photograph! Finding more beauty in winter. 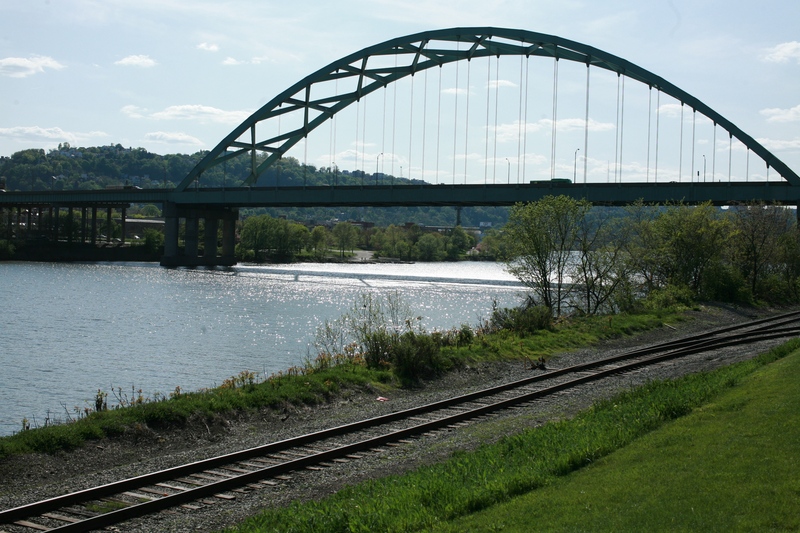 Full photograph of Birmingham Bridge on the Monongahela. Detail of crop from same photo-scroll down. The shadow of the bridge on the sunlit river made a cool pattern. The people showed up when I enlarged the photo.